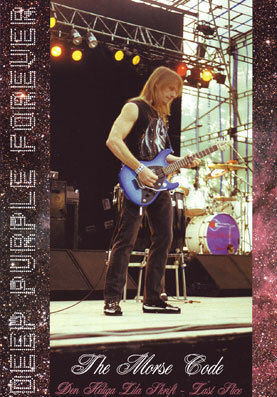 This interview with Steve Morse of Deep Purple was conducted by e-mail in November 2002 and was printed in my last issue of DEEP PURPLE FOREVER (32) a few months later in early 2003. In a recent interview in Classic Rock, Steve says that he had thoughts about leaving Deep Purple around this time, when Jon Lord had quit. I knew, from an earlier interview (from 1998, it´s up on this blog), that Steve had a problem with the long tours, and they were not getting shorter. In fact, when I sent him the questions for this interview I included a couple about this and if he had ever considered to leave the band, but he dodged those and I can see why. I was right on the money though, but to Steve´s credit, he is still in Deep Purple and now he says he would like to be there when they play their last concert. Anyway, here is my last interview with the man. Enjoy. For the sake of getting the history right, do you recall what month back in 1994 that you were approached by Deep Purple to join them? – I´m the worst one for being a historian, so of course, I don´t remember. I was working every day on a Dregs album, I think… or was it a Steve Morse Band album? How would you describe the first few months with them? – It was really the first few days that we spent together on those 4 gigs… then a long time of no contact until we started some more shows, I believe. It was instantly very relaxed and easy to get along with all of them. Since we had all played approximately the same number of years, we all felt comfortable together, and had many common influences. “Purpendicular” is a highly respected album among the fans, what favourite songs do you have on it looking back on it now? – I always like “Sometimes I Feel Like Screaming”, and “A Touch Away” since they were melodic. Historically, I always enjoy listening to the most melodic songs of any albums that I´m involved with. Would you agree that the album is remarkably good considering how new the band was at the time? – New or old, musicians should be able to come up with good stuff anytime that they are given time and opportrunity to do so. At that time, Purple had lost a lot of ground in America since the early days of the reunion. Do you feel that the band has been able to get back on track as far as America goes since then? How do you rate “Abandon” now? – I think it has some songs that have the best feel of anything we have done. The songs were specifically written (in my mind at least), to be good ones to play live. Ian Gillan has a very large influence on which songs we do live, and some of the best ones from that album are not his favorites to sing live. Otherwise, I would love to play “Any Fule Kno`That” every night. What do you think of the Purple DVD`s that you are on? Do you have a personal favourite? – I like the Australian one, it is a good example of the gig that night, as I recall. The one from Miami (“Perihelion”) hasn´t made it to my mailbox yet, but Jon said it was a good gig.